A retrospective exhibition of Sašo Sedlaček’s work entitled Supertrash will open at the Koroška Gallery of Fine Arts in Slovenj Gradec on 11 November 2011. The exhibition will bring together for the first time the most distinctive of Sedlaček’s projects created over the past 10 years. A retrospective catalogue featuring texts by Dr. Petja Grafenauer and Dr. Luka Omladič and designed by Studiobotas will accompany the exhibition. The exhibition Supertrash features the projects Picnic on a Dump (Piknik na deponiji), Beggar (Žicar), Urban – woodenware vending machine (Urban – Avtomat za suho robo), Space Junk Spotting (Vesoljske smeti), The Ex, No Lego, Just Do It!, AcDcWc, The Big Switch Off (Veliki izklop) and others, all of which demonstrate Sašo Sedlaček’s ability to reflect upon waste. 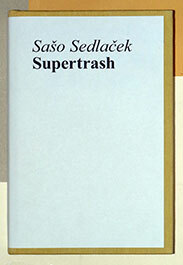 Moreover, regardless of whether he deals with recycling faeces or analogue televisual waves, waste remains the key topic of Sedlaček’s oeuvre. Sašo Sedlaček is, no doubt, one of the key figures of contemporary art in Slovenia. 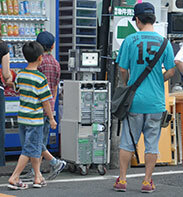 He has received several awards (OHO, Vida 11, Spaport, Zogo Toy, etc. ); he has been an artist-in-residence three times (in Germany, Japan and the United States); he has had exhibitions in Slovenia, Japan, Taiwan, the USA, Austria, France, Belgium, Italy, Serbia, Russia, Estonia, etc. – including established exhibition venues such as the Secession in Vienna and the Lentos Museum in Linz – and he has participated in major international biennials (Taipei, Taiwan 2008 and Ogaki, Japan 2006) and festivals. His project The Big Switch Off was just on display at the Project Space Aksioma in Slovenia. He has recently problematised the sell-out of frequency space (Manifesto, 2008, and Infocalypse Now!, 2007) and he is particularly recognisable for his interventions into consumer Meccas: using bricks made of printed advertising materials, he closed the entrances to department stores in Ljubljana (Just Do It!, 2003) and built a pavilion for eavesdropping and dwelling in BTC City (Loop, 2004); in 2006, he took the Beggar – a robot for the materially deprived, which he lent to the homeless people of Ljubljana the following year – for a walk around Citypark and the streets of Tokyo and Taipei; etc. Thanks to: Hilger Contemporary, Vienna, Austria; Miklova hiša, Ribnica; KD Group, Ljubljana and KGLU, Slovenj Gradec for lending the works, and Pavle Sedlaček for technical assistance on the majority of the projects. Supported by the Ministry of Culture of the Republic of Slovenia and the Municipality of Slovenj Gradec. Printed by: Stane Peklaj, s. p.